Mussels have a pretty good life. They hang around in the ocean for a while, drink up some salt water, and then die in a steaming hot tub of beer or wine. Not bad, right? My husband and I love mussels, and our favorite place to order them is at Hopleaf — a fantastic bar and restaurant in Chicago’s Andersonville neighborhood. An order of mussels, some frites with garlic aioli and a few cold Belgian beers and we’re happy campers. And although mussels may appear complicated, they’re totally not. A whole steaming bowl of these babies takes literally minutes to make, and leaves you feeling like you just indulged in something really special. Most mussel recipes (including this one) recommend using wheat beer, which I’m not the biggest fan of. So, I used Half Acre Gossamer — a local brew that also happens to be one of my favorite golden ales. Don’t like beer? Dry white wine would…er, nevermind. If you don’t like beer, I’m not really sure what to tell you. 1. Heat a large saute pan over medium-low heat. Add the oil. When oil is hot, add shallots and celery; saute for two minutes. Add thyme and bay leaves and continue to cook, uncovered, until shallots and celery are semitranslucent, about two minutes. 2. Turn up heat to medium, add mussels, a tablespoon or so of salt and a teaspoon of freshly cracked black pepper, beer and butter, and immediately cover. Cook until mussels have opened, about three to five minutes. 3. 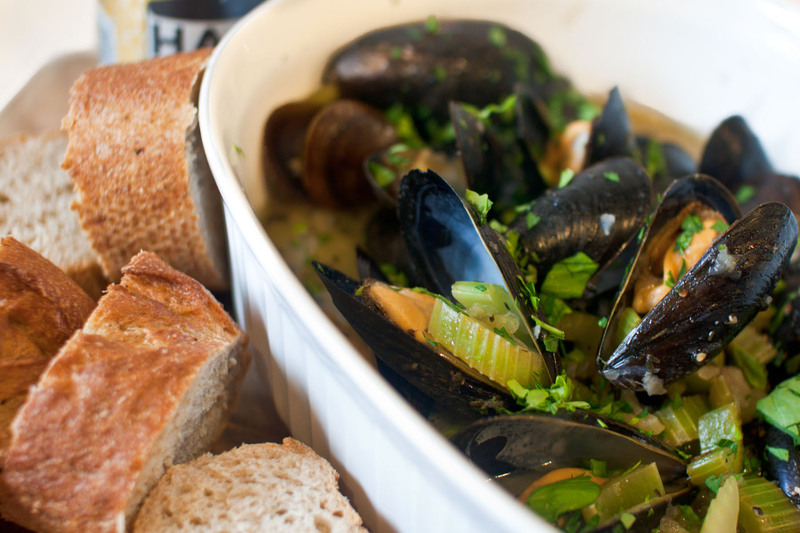 Discard any cracked or unopened mussels and serve — broth and all — in a large bowl with sliced baguette on the side. Yeah. I have a Nikon DSLR with a few different lenses. Although I am amazed at how much better the iPhone 4’s camera is compared to the 3G. I always wanna cook mussels but feel a strange intimidation – this is accessible (and I’ll bet delicious). Thanks! 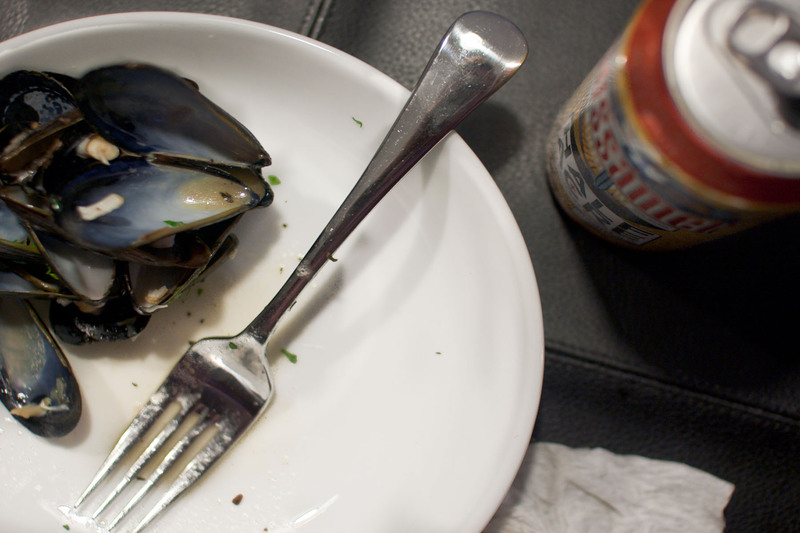 Beer and mussels are my idea of a great time; throw in some fries and aioli and that’s what I call a full on party! My summer will not be complete until I make a mussel feast! Mmmmm! Mussels are one of my favorites. Scott and I made them for our low-key Valentine’s Day dinner at home. Looks delish! Oh man I LOVE mussels! Now I’m hungry!!!! I love mussels!! I don’t know if I’ve ever had them with beer, though…sounds so good! Am only a little ashamed to admit that I ate these right out of the skillet. I wouldn’t be ashamed at all. Glad you liked them. Exactly. Who wouldn’t love beer?! I am a huge fan of mussels, too. I could eat them as my meal with a pint of beer and would be as happy as a clam. Yum.